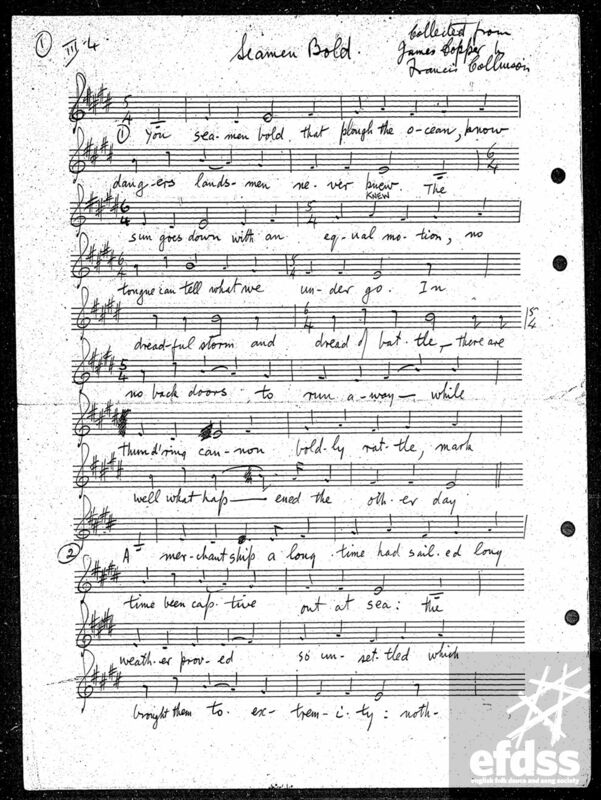 Another song he submitted to Sing (August/September 1957) was a version of ‘Lord Franklin’ collected, so he said, from Edward Harper, a whale-factory blacksmith from Port Stanley in the Falklands. 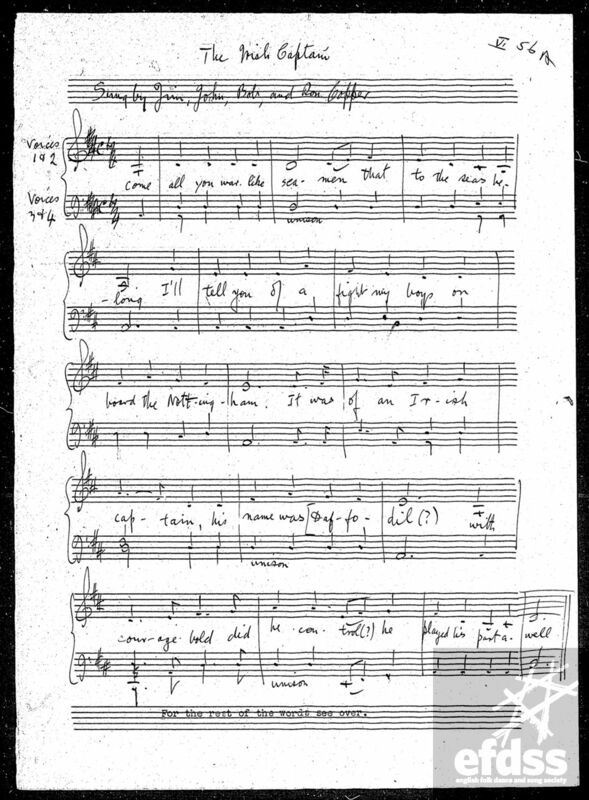 Later, on page 192, he comments on songs such as ‘Lord Franklin’ and ‘Farewell to Tarwathie’, which Lloyd claimed to have collected in 1937, but which he kept to himself until twenty years later. 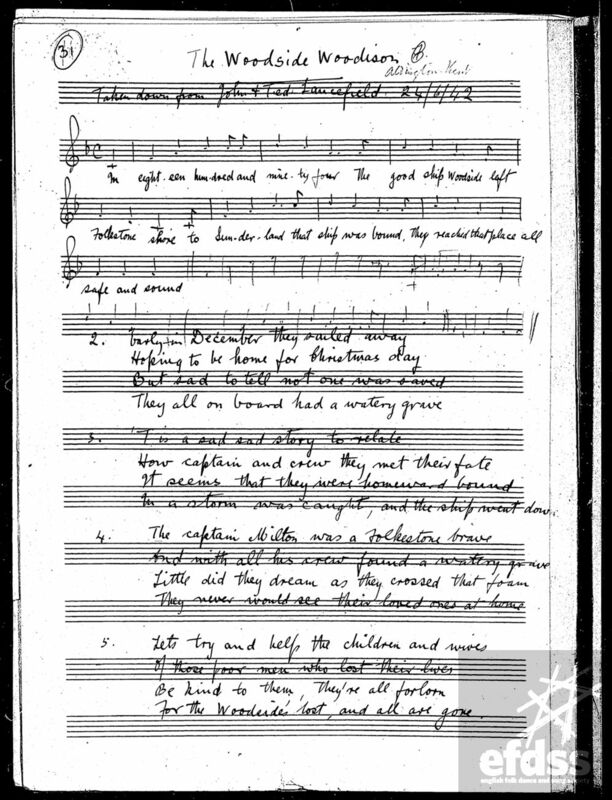 Why, Dave Arthur asks, was there no mention of them in The Singing Englishman (1944) where he specifically says says that the whaling ship workers didn’t have their own repertoire, but sang the same songs as in factories ashore? If Bert did indeed collect them he was remarkably fortuitous. If not, he was remarkably talented. Either way they are fine songs and deserve their popularity. In fact songs about Lord Franklin have been collected in oral tradition, in Canada, Scotland, and Ireland – there’s a version in Sam Henry’s Songs of the People which shares some verses with the Bert Lloyd version. 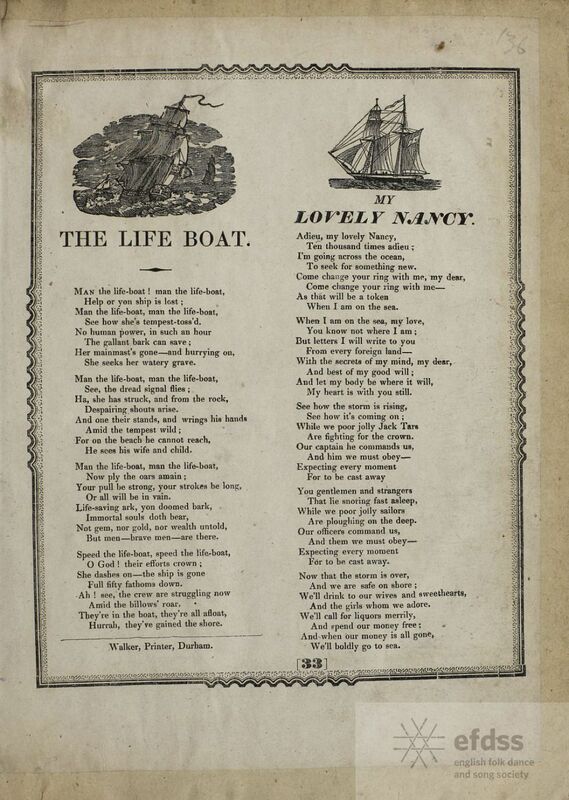 And needless to say there were numerous broadside printings – see the Bodleian’s Broadside Ballads Online site, for example. 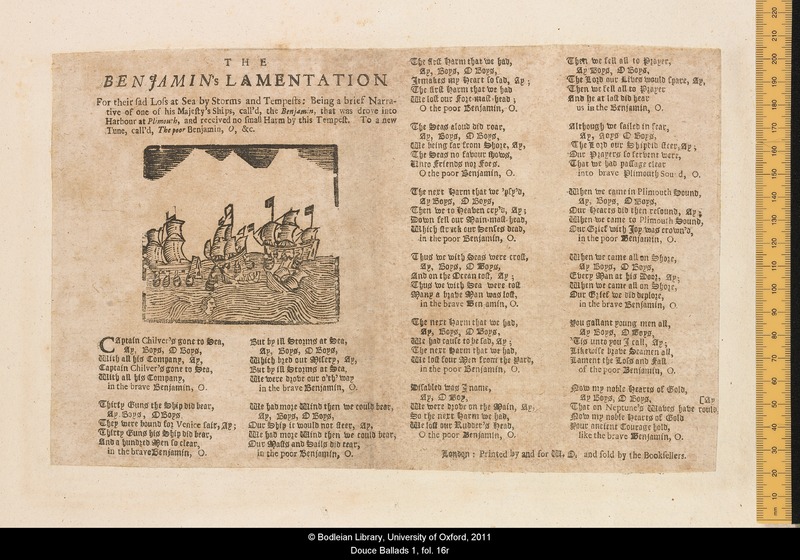 Lady Franklin’s lament for her husband, from Broadside Ballads Online. I first heard this song on the Pentangle LP Cruel Sister, where the arrangement featured a rather tasteful electric guitar solo from John Renbourn, and Bert Jansch playing chords on the concertina (was this the only sighting of Jansch playing the instrument, I wonder?). At the time I had never heard of Lord John Franklin or his ill-fated Arctic expedition of 1845, but this song captured my imagination, as it has many others’. 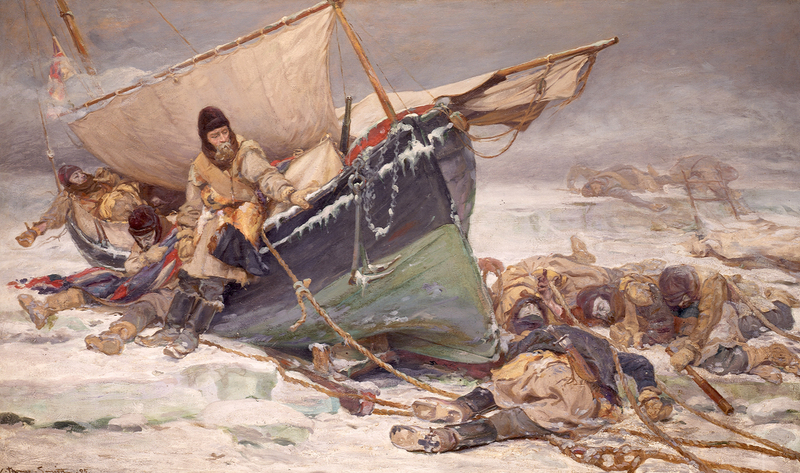 In the 1980s I read Frozen in Time: The Fate of the Franklin Expedition by Owen Beattie and John Geiger, in which they suggest that lead poisoning, from the lead used to seal tinned foods in those days, was a significant contributory factor to the deaths of all of Franklin’s crew members (although, obviously, getting stuck in the ice in the first place was the greatest contributory factor!). That argument is supported by an article in the journal Arctic in 1997, The final days of the Franklin expedition : new skeletal evidence. 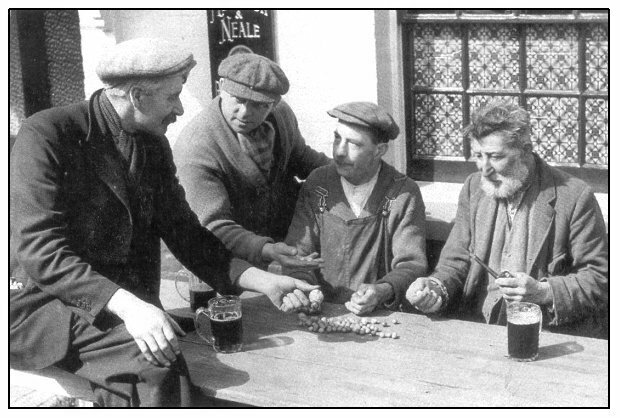 However I seem to remember that in a question on QI a few years back, about the eccentric behaviour of members of the Franklin expedition in their final days, “lead poisoning” was the wrong answer, and in fact it was an opportunity for panel-members to play their “Nobody Knows” cards. I wasn’t sure if I’d made this up, but this Guardian article from 2014 reports that “New research suggests that ice, not contaminated food, killed Sir John Franklin and his crew in 1845”. I love the fact that “the fate of Franklin and his gallant crew” is still exercising scientists as well as folk singers. 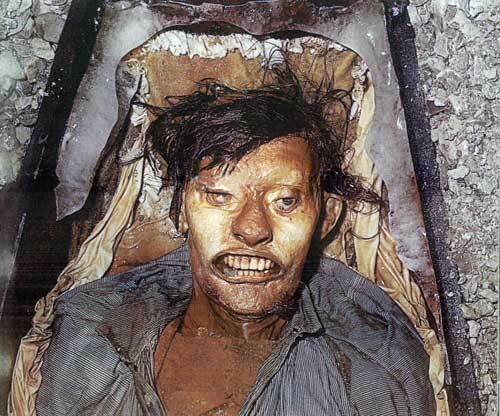 The mummified remains of John Hartnell, a 25-year-old member of the Franklin Expedition who died on January 4, 1846 and was buried at Beechey Island in the Canadian Arctic. Image copyright University of Alberta. About four or five years ago I went to see Martin Carthy and Dave Swarbrick at the Cornerstone Arts Centre in Didcot. This was one of the songs they played and, chatting to Martin in the interval, I must have mentioned it for some reason. 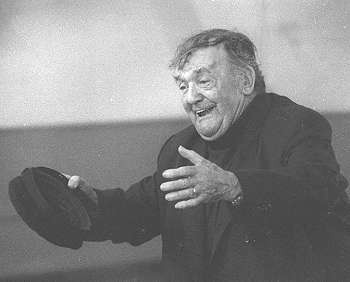 “You should sing that”, said Martin, “it would suit your voice”. Well, if Martin Carthy MBE recommends that you sing a particular song, it strikes me that the only possible course of action is to follow his advice. In fact I had known it vaguely, many years ago, as a result of buying a copy of the LP No Relation by Heather Wood and Royston Wood. I’d largely forgotten about it though, so set about learning it anew. I sought it out from the Journal of the Folk-Song Society No. 11 – completely forgetting that in fact it’s in the Penguin Book of English Folk Songs. The version in the Penguin Book was taken down by Henry Hammond from Joseph Taunton, at Corscombe in Devon in 1907, and published in the Journal of the Folk-Song Society the same year. 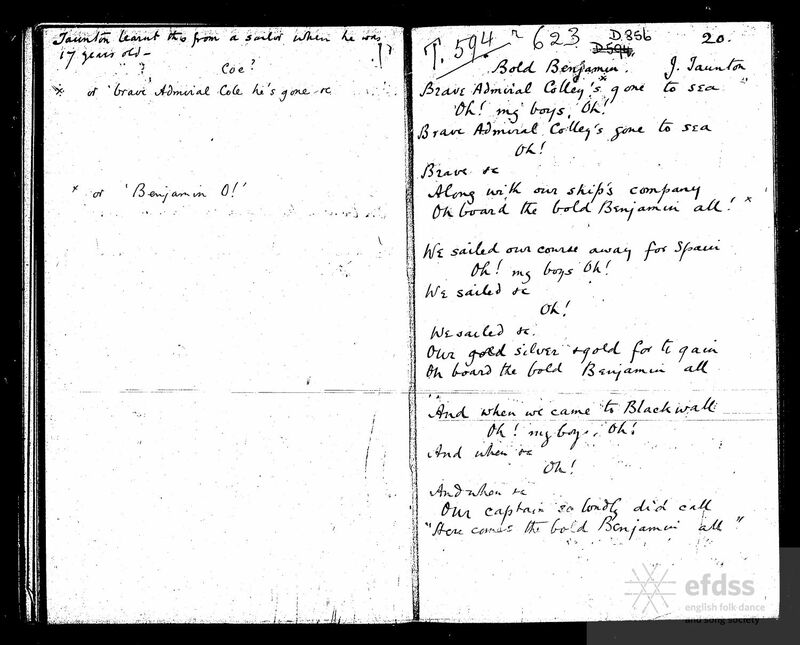 Hammond’s notes say that “Taunton learnt this from a soldier when he was 17 years old” (in the Journal the song’s provenance is given as “Mr. Taunton learnt the song 50 years ago from a man-of-war’s man” i.e. he learned it circa 1857). The Bold Benjamin, collected by H.E.D.Hammond from Joseph Taunton, 1907. From the Full English archive. A much earlier ballad, the earliest known version of which was printed in the 1670s, is entitled ‘The Benjamin’s Lamentation For their sad Loss at Sea by Storms and Tempests: Being a brief Narrative of one of his Majesty’s Ships, call’d, the Benjamin, that was drove into Harbour at Plimouth, and received no small Harm by this Tempest’. Captain Chilvers is the “hero” in this case, and the song details – at somewhat tedious length – the various harms that befell the ship and its crew. Strangely, although one might think that a song like this must have at least a kernel of truth, researchers have so far been unable to track down either the ship, or the hapless captain / admiral.